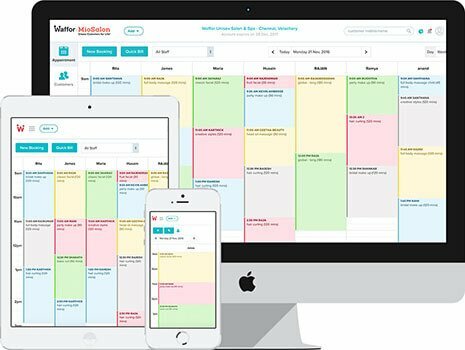 With Miosalon Streamline your Salon’s/Spa’s Appointments on a single Screen Calendar page. Miosalon provides you a simple yet a standard billing solution with an automated offer redemption feature. It comes with a Permission, Addressed and Threshold Marketing tool it will help you to shoot up your revenue. Get sales, customer, staff and stock insights. Keep an eye on from most valued customers to the most loved services. Tab and Mobile friendly UI. Get most popular out-of-box reports Sales, Revenue, Product, Services, Staff, Customer and more reports. Centralized and 360 customer profile. Integrate MioSalon booking widget with Razor payment gateway & let your customers make the purchase 24X7 from anywhere. Now Sync your booking widget with Stripe payment gateway & allow your customers to purchase anytime, anywhere. Collecting payment using square gives the flexibility to run your business using tab or mobile. Integrated Credit Card processing makes your POS complete. EVM supported. Powerful Salon & Spa Software with all features at affordable price. Why Mio Salon Scheduling Software? Loved by wellness and beauty industry owners for salon management & business growth. MioSalon is very easy to use and intuitive. Less training time for staff is enough as it is so simple. Reports and predictors are very useful. Very responsive support team and open to new ideas. The data gets updated fairly quickly and also have all the reports I needed. Waffor's Salon software has been working great for us. One of the best thing is, it has a clean and easy to use interface when compared to the softwares. They have a dedicated support team to rely on.